I heard from a friend that Alton Brown had done a nog episode for Good Eats, and since Alton has seldom steered me wrong, I decided his would be a good base recipe and a great introduction to eggnogs. One thing I like about Alton Brown is that his recipes are usually a good jumping-off point for experimentation. Once you have the basic flavors and techniques down, you can start to improvise. I won’t reproduce his recipe here, but I will talk about his technique: He starts by separating four eggs, beating the yolks until they’re light and then adding sugar. He blends a mixture of milk, cream, bourbon, and nutmeg into the yolks. He whips up the whites separately, adds a bit of sugar, and then folds the dairy/yolk mixture into the whites. He chills this for at least an hour before serving. After I finished mixing it all up, but before chilling it, I pulled a bit aside for us to taste. Jen and I both loved this recipe, low-octane though it may be. The nog was fresh, creamy, rich, and delicious, with just a hint of bourbon. A hint of booze, however, is not enough for this drink, so when I served it, I poured a couple ounces of dark rum into a glass, added the nog, and stirred. Next time I make this, I’ll very likely just add more booze from the start. And speaking of the Food Network, I was running on the treadmill at the gym yesterday and watching Food Network (what can I say; it motivates me) and I happened to catch this week’s episode of From the Can Atrocities with Sandra Lee and she made the three most appalling holiday “cocktails” I have ever seen. One of them was garnished with a candy cane. Another won had a rim dipped in honey and ADORNED WITH COCONUT FLAKES. I have never been so frightened. Sorry it took so long for comments to appear. My sites are blocked by the filtering software at work (sigh), so I can only check comments when I get home (double sigh). I think I need to give my wife moderator access here so we can keep the conversation flowing when people have something to say. Dana, glad to hear the Ronnybrook is good. We love their creamline milk, cream, and ice cream, so I’m not surprised to hear their nog is yummy. We’ll have to get some from Whole Foods or Fresh Direct. As an aside, and speaking of good dairy, have you been to Saxelby’s Cheese in Essex Market? Yummy cheese, and Anne the owner is a total sweetheart. Merry: One reason to put the booze into the nog is that it helps mature the eggs and kill any yuck. It also becomes part of the mix as the flavors meld in the fridge. Instead of doing just a Shirley Temple version, I’d instead make two pitchers–one for the adults and one for the kids. Just make sure you mark them well. As an aside, we miss you guys. Wow, whoever steered you towards the Good Eats eggnog must be super awesome. I made a batch myself, but was too impatient to chill the nog sufficiently before consumption. Given the size of the glasses we used, we only got 3 servings out of the batch, so 3 ounces of bourbon seemed to be about right. I used regular-ole Maker’s Mark for mine. I could go higher octane but I don’t think I d want to go too far if I continue to serve it up in pint mugs. 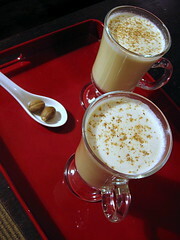 I used to nog every year, and that’s pretty much the recipe I followed, though my spices were different. The balance between cream and whites is key. Also I liked rum instead of bourbon for mine back then, as I was a weird little kid.